Wow – it’s been too long since I posted any recipes! It’s not that I haven’t been baking, because I have. In fact, I’ve got my third cake for the week in the oven as I write this. I’ll get those recipes posted later. For now, since I’ve been such a slacker, here are two recipes I made recently to take to the dojo. I’m always hungry after a workout, especially after those two hour pre-black belt test workouts. And because I think every event needs treats (you know I do! ), I made some goodies to help everyone replace the calories we’d just burned off. Both recipes are simple, and both travel well. Click for recipes. 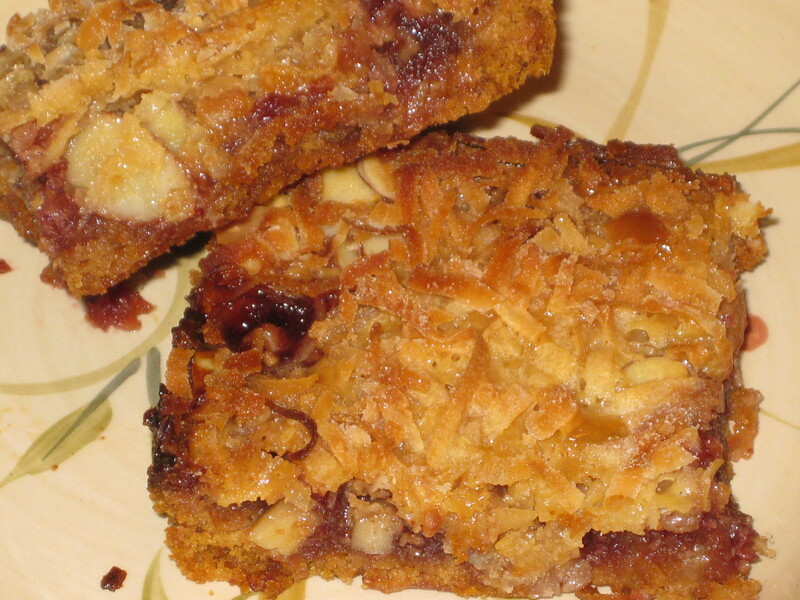 The Raspberry Magic Bars are adapted from the classic Magic Bar recipe. Instead of using chocolate chips, these use jam or preserves for a fruity twist. I chose seedless raspberry preserves with almonds for the filling. The result was a very simple, but delicious treat which truly is magical! They are a very sweet bar, so if you prefer things a little less sweet, you can make some adjustments. For me, the next time I make them, I’ll use a little less jam, substitute a stronger nut such as pecans or walnuts, and add some dark chocolate chunks or chips. I think the dark chocolate and raspberry will nicely complement each other. Mmmm… I can’t wait to try that combination! If you have a favorite preserve flavor or jam, use that instead of the raspberry. 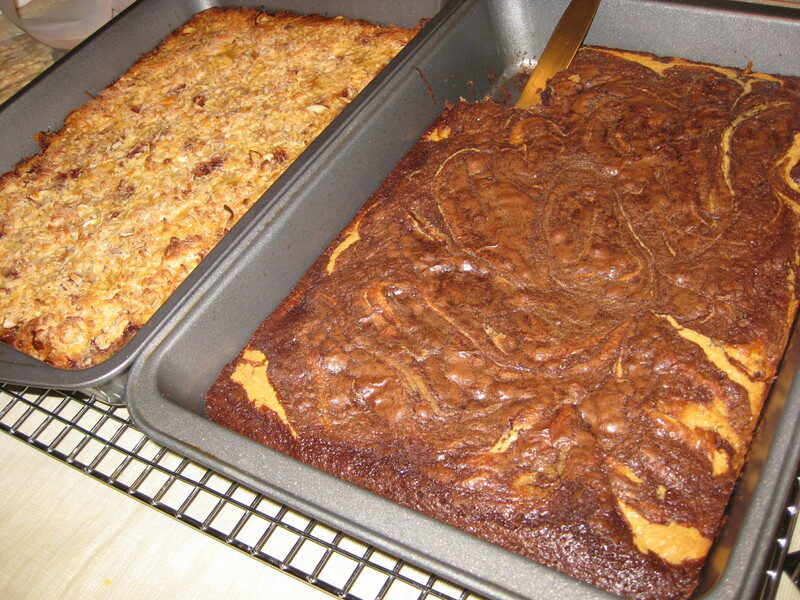 The Peanut Butter Brownies were OK. 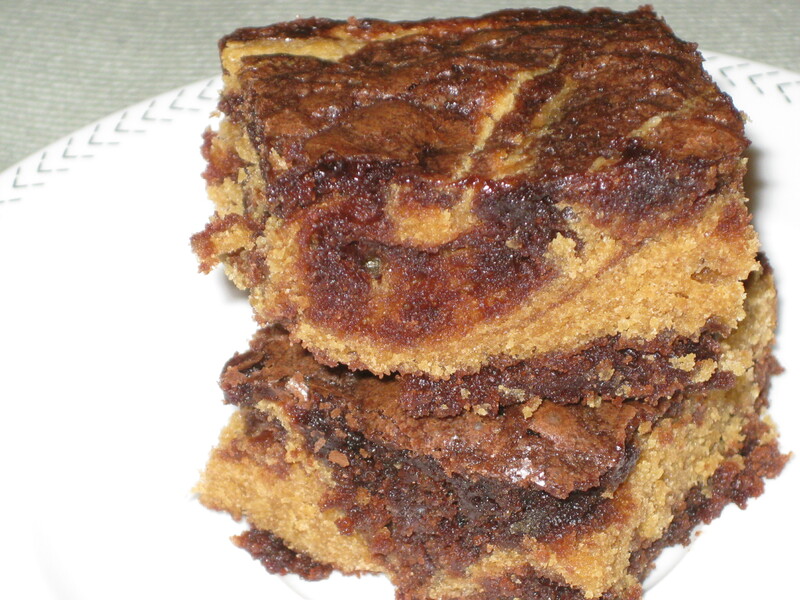 I can’t say they were my favorite brownie recipe, but I’ll probably give them another try. They start with a brownie mix, so they’re fairly simple. Keep an eye on the baking time so they don’t dry out. While the recipe calls for creamy peanut butter, I think they’d be good with chunky peanut butter or with the addition of chopped peanuts or peanut butter chips. There you go. Two sweets to help you get your sugar fix!